Today we welcome back a special guest on the blog: Stelter Senior Technical Consultant, Lynn Gaumer, J.D. Lynn returns to share her insights on promoting, receiving and acknowledging donor advised fund gifts. Donor advised funds date back to the Great Depression, yet they were not actively promoted until the early 1990s when Fidelity established Fidelity Charitable. A middleman was inserted into the charitable giving process. Organizations did not have immediate use of the charitable dollars. There were administrative and investment fees associated with the account. There were no minimum distribution requirements—the funds could remain in the account in perpetuity. Times have changed and your organization should, too. Donor advised funds are the fastest-growing source of philanthropy, now accounting for more than $110 billion in total charitable assets. Fidelity Charitable, the nation’s largest nonprofit, released its 2019 Giving Report. It made $5.2 billion in donor recommended grants in 2018, a 17 percent increase from the previous year. (The average Giving Account at Fidelity Charitable recommended more than 10 grants, nearly twice the average 10 years ago.) The number of charities that donors support has more than doubled in the past 10 years. It is very likely that some of your donors are included in these figures. Grants were made to 142,000 nonprofit organizations of all sizes, including local, national and international groups. * If your organization is in the education sector, it is more likely to receive grant dollars from donor advised funds. Twenty-nine percent of grant dollars support education. The religion sector received the greatest grant volume with 27 percent. The ease and convenience of donor advised funds make them a popular choice. In addition, many sponsoring organizations can accept complex assets while some nonprofits cannot, making them attractive to sophisticated donors. In 2018, for example, contributions of non-publicly traded assets to Fidelity Charitable hit a record setting $1 billion. If you are not actively including information about donor advised funds in your promotional material, you are likely missing out on some gifts. 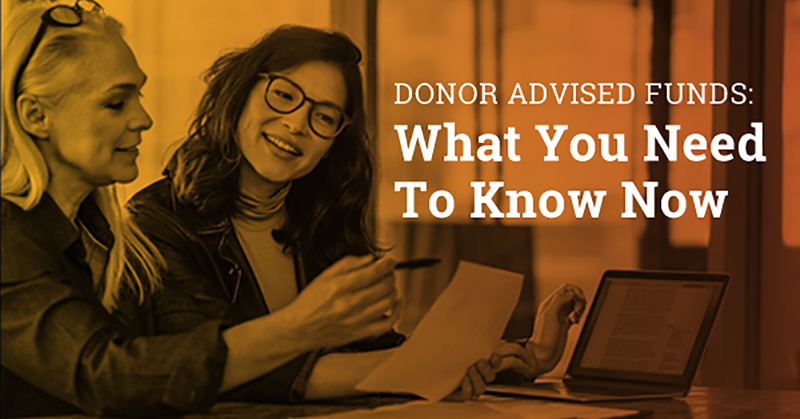 Here are few recommendations on how to make it easy for your donors to give through their donor advised funds and properly acknowledge the gift. Make sure your donors know that your organization accepts grants. Donor advised funds should be promoted through a multichannel marketing strategy that consists of print, digital, social media and web. Sixty percent of grant recommendations are designated “where needed most”. Donor advised funds have succession plans. When creating a donor advised fund, donors may select a succession plan to guide the sponsoring organization on how to make grants after their lifetime. One option is to name your organization as a beneficiary to receive a dollar amount or a percentage of the remaining assets. Think digital. Many nonprofits have a “Give Now” or “Donate Now” button on their websites. Traditionally, these are a convenient ways for a donor to make a quick donation via debit or credit card. Given the explosion of donor advised funds, consider a third option for donors to recommend grants from their donor advised fund accounts. You can also include a DAF Direct widget on your website. Chances are, your organization has already received a grant from a donor advised fund. Did you send a tax receipt? How did you thank the donor? Who is the donor —the account owner or the sponsoring organization? This can get a little tricky. Many organizations feel they need to send a tax receipt or acknowledgement letter to the sponsoring organization. This is not necessary. It is very important, however, that you properly thank the person who recommended the grant. This is your chance for good stewardship. Ninety-two percent of donors include their names and addresses on grants*; so it should be easy to determine where to send a personal letter. Thank you for recommending that we receive a generous grant of $XXXX through your donor advised fund at XYZ Community Foundation. We received the grant on (date), and the funds will make a difference in your community. Thank you again for caring so deeply about the mission of ABC Charitable Organization. We are grateful for your support. Make sure your marketing calendar incorporates a strategic plan to promote the distribution of these funds to your organization. Contact The Stelter Company for the industry insight and creative services that will help you stand out from the other 1.5 million nonprofits. Thank you for sharing a link to one of my posts about Donor Advised Funds. While we’re seeing a sharp increase in the use of DAFs by donors, charities are lagging behind when it comes to making it easier for donors to give through their DAFs. The bottom line is that if a charity wants money from a donor, it needs to make it easy for a donor to give. Pretty simple, huh? So, why are so many so slow at adopting tactics to make giving easier for donors? Michael, I wholeheartedly agree! I feel like we’re starting to see the tide change a bit, but definitely the last couple years there was quite a bit of reluctance on the fundraisers part to engage donors around their DAF. My philosophy is “you need to meet the donor where they’re at”…if their comfort and preference is through a DAF, don’t avoid it and/or discourage it…embrace it and welcome it! Pretty simple really.